"My whole family loves this beefy lasagna flavored with taco seasoning. Even my picky five-year-old will eat it. 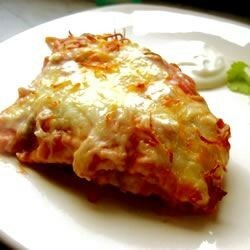 Serve with shredded lettuce, fresh sliced tomatoes, olives and sour cream." In a large skillet over medium-high heat, brown the ground beef, and stir in the taco seasoning and tomatoes. Line a 9x13-inch baking dish with half the tortillas. Spoon the beef mixture into the dish, then top with the remaining tortillas. Spread salsa over the tortillas and sprinkle with the cheese. A versatile taco crowd-pleaser that serves up perfectly as an appetizer or meal.